Our software was made by ranchers, for ranchers to help you manage day-to-day operations efficiently and effectively. Our online reservation software was designed with guest ranches in mind. Use real-time calendar availability, online deposit payments, and more to help provide customers with a better reservation experience that starts from the first click. Customers see current availability for your ranch on a real-time calendar. Gather the information you need to give your guests the vacation of a lifetime. Reservations can be booked online and deposits are received electronically. Automate emails and reminders to guests, and send satisfaction surveys. Give guests the best experience by streamlining booking and allowing them to create their dream getaway online. Our platform helps you and your staff save time, collect detailed guest information, and reduce overall costs for your ranch. Attract and book more guests from more places with the 24/7 convenience of booking online and best-in-class customization. We’re helping guest ranches get more done and put time back into more important tasks. Want to see how? Sign up to receive a private demo of our software to find out how we can customize our platform to your ranch’s needs. Ranch Bookings has your back through every step of the guest experience. 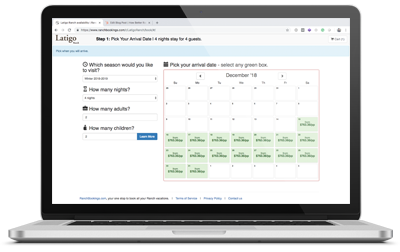 Our reservation management software helps guest ranches manage bookings and guest information better, so they can put time back into what matters.